Case Keenum scrambles. Credit: Ron Chenoy, USA TODAY Sports. The last two weeks have been rough for the stocks of both Case Keenum and Vance Joseph. Following losses to both the 49ers and Browns, it seems like only a matter of time before the Broncos move on to a new coaching staff this offseason and possibly, a new quarterback. Fans are already clamoring for a John Harbaugh and Joe Flacco relocation to Denver. Harbaugh would be a fantastic coaching candidate (although it now seems unlikely the Ravens will fire him), but the best course of action at quarterback for the Broncos in 2019 would be to stick with Keenum. I can already hear the angry mob of Coloradans getting ready to knock down my door, but don’t raise your pitchforks quite yet. I’m not saying Keenum should be the quarterback of the future, just that there are no better veteran alternatives for the 2019 season. To defend Keenum, this is his first year in a brand new system, something that causes many quarterbacks to struggle. Look no further than Matt Ryan, who had his worst season of the past five years during Kyle Shanahan‘s first season in Atlanta. The next year, he won the MVP. Now, I’m not saying Keenum’s leap will be quite so impressive, but the potential for a big improvement is there, especially when you look at his supporting talent. Of the nine players to catch a pass from Keenum over the past two weeks, only two were on the team last season. They are the team’s No. 3 running back Devontae Booker, and second-year undrafted receiver Tim Patrick, who Denver signed to their practice squad in October of last season. Of that same nine players, four are rookies. With a year of experience and chemistry under their belts, the offense should be expected to take a step forward. Another season of the Keenum to Patrick connection probably does not excite many Broncos fans, but I’m still not convinced there is a better answer. First, it seems incredibly unlikely the Broncos would sign another free agent quarterback after signing Keenum last season. According to Spotrac, Keenum is due $21 million next season, and even if the Broncos were to cut him he’d still cost $10 million in dead cap. Free agent quarterbacks that would be an upgrade on Keenum, like Joe Flacco and Teddy Bridgewater, will be able to negotiate for around $20 million annually. That means if the Broncos were to pursue one of these free agents, they would be allocating over $30 million to the quarterback position. The only team paying more for a quarterback would be the Packers, because of Aaron Rodgers, who is arguably the best quarterback in the league today. If the Broncos were to sign either Flacco or Bridgewater, the price tag would do serious damage to the roster. That can be OK if you’re paying an elite quarterback who can carry a less talented, cheaper roster, but it can be devastating if you’re paying a Joe Flacco. You have to look no further than Flacco’s last contract to see evidence of this. After winning the Super Bowl in 2012, the Ravens made Flacco the highest-paid quarterback in the league. In the five years since signing that deal, the Ravens have not won the division, had an average record of 8-8, made the playoffs once, and struggled through a 5-11 season. In the five years prior when Flacco was still on his rookie deal, the Ravens won the division twice, had an average record of 11-5, made the playoffs all five years, and won the Super Bowl. The solution for the Broncos is not allocating $30 million to a quarterback room headlined by that guy. It should also be mentioned that the Broncos could draft a quarterback in 2019 to replace Keenum. I would argue against this though, unless John Elway was comfortable with jettisoning his draft pick almost immediately to draft a better prospect in 2020, similar to what the Browns did with DeShone Kizer in 2017. This is because the 2019 quarterback class is often seen as the worst since the 2013 one that pumped out Geno Smith and E.J. Manuel as its top prospects. If the Broncos are able to hold off on drafting a quarterback for one more season, they’ll get to enjoy a 2020 class that will feature Alabama’s Tua Tagovailoa, Georgia’s Jake Fromm, Washington’s Jacob Eason, and possibly Oregon’s Justin Herbert (who would be the best prospect in 2019 but the fourth-best in 2020) if he chooses to stay in school. 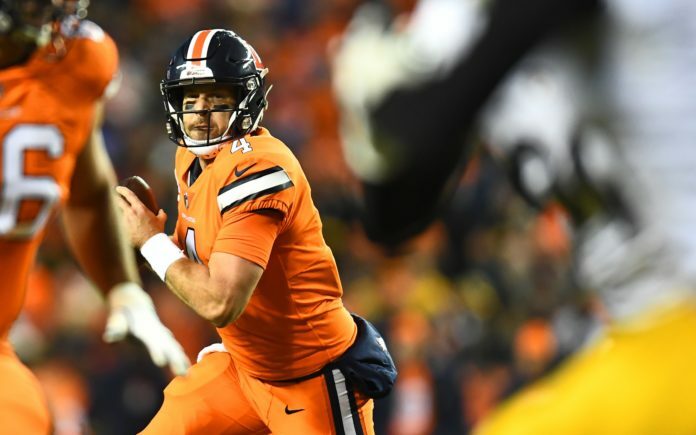 There is no doubt that the Broncos have a hole a quarterback, but 2019 is not the time to fill that hole quite yet.